Play Tecmo Super Bowl Now! Tecmo Super Bowl was a pretty good football game for its time. The graphics were pretty good but not great. It did have some pretty cool cut scenes for the big plays. 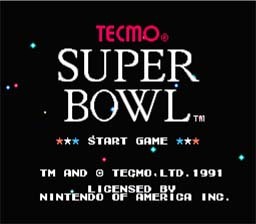 Tecmo Super Bowl was the poster-child for football on the NES. This was the best football game that was on the NES at the time. This is a good example of a great football game on the NES, give it a try. Try to get more touchdowns than your opponent. Hold B and press left at the title screen. Press up or down to select a sound.